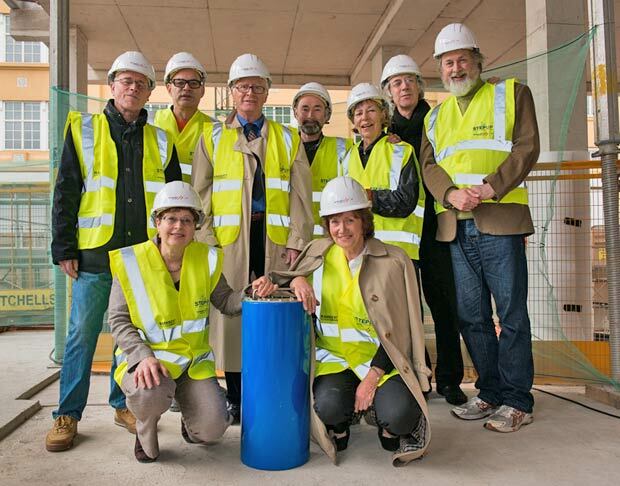 Rambert Dance Company’s Artistic Director, Mark Baldwin, joined by former Artistic Directors or their representatives, to bury time capsule at Rambert’s new headquarters on the South Bank. Back L-R: Tim Ellis, Mark Baldwin – Artistic Director, John Chesworth, Christopher Bruce, Val Bourne, Robert North and Richard Alston. Front L-R: Matilda Ellis and Prue Skene. It’s finally happening: Rambert Dance company’s new headquarters on the South Bank is under way, its foundations well and truly sunk. Before the next phase of building goes ahead above ground, a time capsule in a stainless steel tube was buried in concrete, not to be opened for at least 50 years. A small ceremony on the building site behind the National Theatre was attended by golden oldies kitted out in hard hats and visibility jackets. Most of those present had kept in touch over the years, but those who hadn’t found it hard to recognise colleagues who’d lost their hair or gone grey, grown beards or needed glasses. Identities re-established, the chatter was as lively as a school outing. Mark Baldwin, the company’s artistic director for the past ten years (and not yet an oldie), was joined by the former directors still with us: John Chesworth (1974-1980), Robert North (1981-1985), Richard Alston (1986-1992) and Christopher Bruce (1994-2002). Norman Morrice (1970-1974) was represented by Val Bourne and Dame Marie Rambert by her grandchildren, Matilda Cockbain and Timothy Ellis. All had contributed belongings for the time capsule, including a lock of Marie Rambert’s hair, letters from her to Chesworth and Alston, a well-worn pair of Bruce’s favourite dance shoes and Baldwin’s notebooks, as well as programmes and photographs. Current Rambert dancers have also provided several items to represent their daily working life – toe tape, a foot roller, a shaker for protein-based food supplement and a packet of Jelly Snakes. What might future generations make of these mementoes? 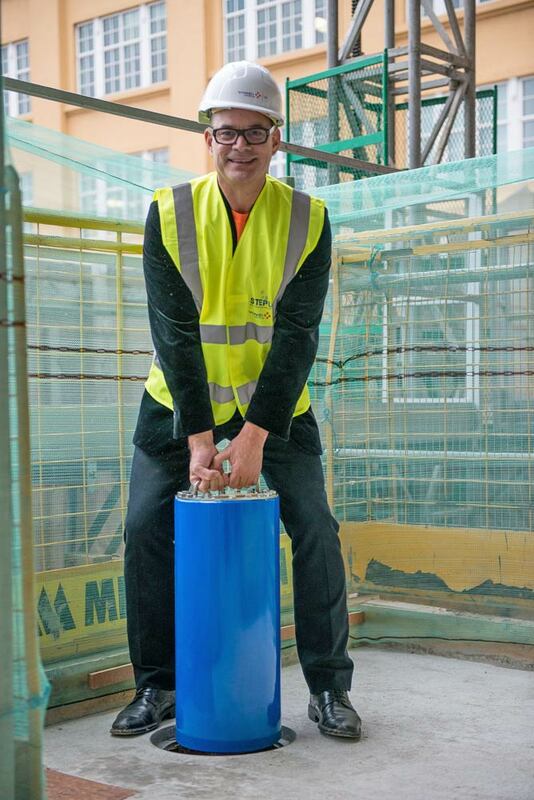 Rambert Dance Company’s Artistic Director, Mark Baldwin, buries time capsule at Rambert’s new headquarters in the South Bank. My own memories of Rambert’s dancers in performance go back to 1966, when Ballet Rambert transformed itself into a contemporary dance company, re-starting modestly at the tiny Jeanetta Cochrane Theatre in Holborn. So I was able to recognise the names, if not always the faces, of Gideon Avrahami, Kenneth Bannerman, Nicoline Nystrom, Patricia Rianne – and Diana Payne-Myers, who goes back far longer than the 1960s and still performing at 83. Presiding over the short ceremony were Prue Skene, chair of Rambert’s board and President of the Mercury Club, and Nadia Stern, CEO of the company. They were eager to thank Ian Tuckett, leader of the Coin Street Community Builders team, for making the site available for the new building. Fortunately for the long-awaited project, he’s a committed dance lover as well as a builder. The £19.6 million headquarters (fund-raising is in its final stages, with ‘just’ thousands of pounds to go) is designed by architects Allies and Morrison, responsible for renovating the Festival Hall/South Bank area. There are to be three spacious dance studios, set and costume workshops, offices and purpose-built storage for the company’s precious archives. As the longest established British dance company, Rambert has invaluable records, to which researchers will at last have ready access. Would that the Royal Ballet could make such provision! Before leaving, we were shown the already sunken dock into which the company’s touring container will be driven, ready to be loaded under cover – a provision the architects managed to accommodate. We had to imagine the rest of the building, with the aid of plans placed in a reception room at the nearby British Film Institute. That was where the ceremony ended and the party began. 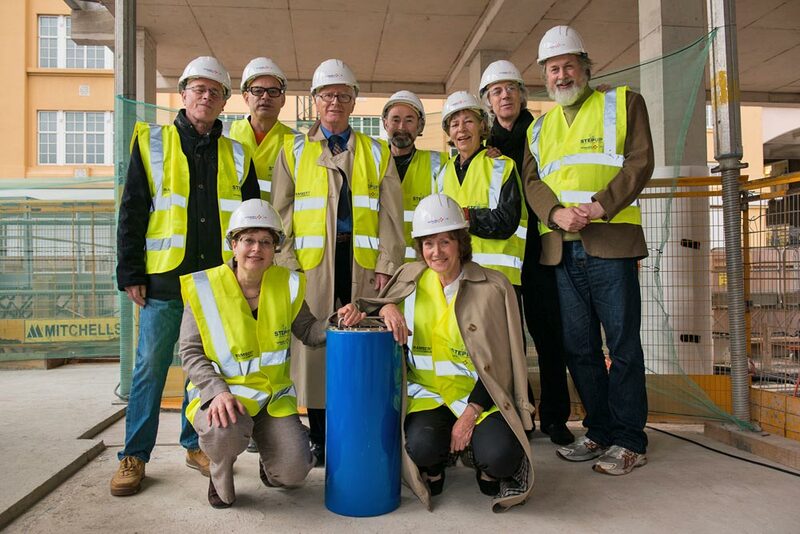 On Friday 28 September Rambert Dance Company’s Artistic Director, Mark Baldwin, joined by all the former artistic directors of the Company or their representatives, Chief Executive Nadia Stern and former Company dancers, will bury a time capsule in its new purpose-built headquarters on London’s South Bank. This event marks another step in Rambert’s development, as the Company prepares to move to brand new premises in Autumn 2013, but also celebrates the contribution of everyone who has made Rambert the exceptional company it is today. Items included in the time capsule include a lock of Marie Rambert’s hair, Equity cards for Angela and David Ellis (Rambert’s daughter and her husband, both active within the Company), a favourite pair of former Artistic Director Christopher Bruce’s dance shoes, as well as programmes, personal correspondence and photographs. Rambert has an excellent archive which charts the official side of the work of the Company, so we wanted our time capsule to contain records and objects that give a sense of what everyday Company life is like. We also wanted to celebrate the contribution of the Company’s seven artistic directors, five of whom we have gathered together to mark this occasion with us. 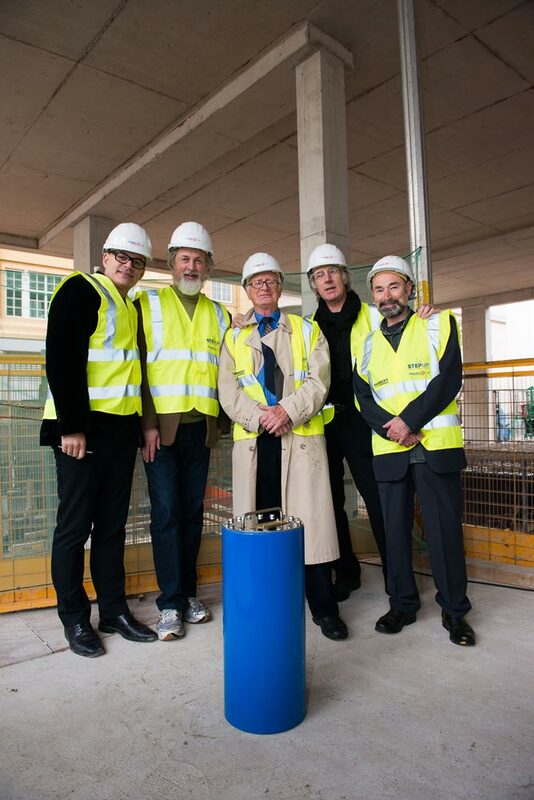 Rambert Dance Company’s Artistic Director, Mark Baldwin, joined by former Artistic Directors to bury time capsule at Rambert’s new headquarters on the South Bank L-R: Mark Baldwin, Richard Alston, John Chesworth, Robert North and Christopher Bruce. The most treasured item is the letter from Dame Marie Rambert written to me just after the 50th Anniversary performance at Sadler’s Wells, which I feel represents all the years I worked under Marie Rambert and the ever lasting memory of her. Although a challenge to arrange, the evening was made by the contribution of a work by Sir Frederick Ashton and a wonderful salute to Rambert herself by Christopher Bruce. Current Rambert dancers have also contributed several items to represent their daily working life – toe tape, a foot roller, a shaker for protein-based food supplement and a packet of Jelly Snakes. The new building, in which the time capsule is being buried, will be an accessible world-class facility comprising three large dance studios, set and costume workshops, offices and archive. The total cost of the project is £19.6 million, £7 million of which was awarded by Arts Council England. Rambert has raised nearly £12 million of the fundraising target from private sources, and is now in the final stages of the public fundraising campaign. The Rambert Capsule will be registered with the International Time Capsule Society, with a request that it is not opened for at least 50 years. Time capsule compiled by Nadia Stern, CEO Rambert Dance Company from 2007. MARIE RAMBERT (Ballet Club/Ballet Rambert 1926 – 1982). Founder Director. We have included a lock of Marie Rambert’s hair for good luck; Equity cards from Anne Ashley (stage name for Angela Ellis, Rambert’s daughter) and Angela’s husband, David Ellis (donated by Matilda Cockbain and Tim Ellis) plus a short note from David. Both Angela and David were closely involved with the Ballet Workshop and Ballet Rambert for many years. NORMAN MORRICE (Ballet Rambert 1952 – 1974). Dancer 1952 – 1964; Associate Director 1966 – 1970; Co-Artistic Director with Marie Rambert 1970 – 1974. An edition of dance and dancers that features ‘Marie Rambert and her new company’, dated November 1966. This contains a fascinating interview with Marie Rambert and Norman Morrice (donated by Val Bourne). JOHN CHESWORTH (Ballet Rambert 1951 – 1980). Dancer 1951 – 1974; Assistant to the Directors 1966 – 1974; Artistic Director 1974 –1980. A letter from Marie Rambert following the 50th anniversary performance at Sadler’s Wells June 15 1976; a ticket for that performance and the programme; seven good luck postcards from Norman Morrice for premieres of his ballets, including his first ballet Two Brothers in 1958; ideas for John’s first ballet Timebase in 1966 (the advert for which appears in the copy of dance and dancers above); a rough copy of the words (transcribed on tape by the BBC Radiophonic Workshop), used in the 2nd movement of Timebase – a solo for a boy – which is a treatment of the Oxford Dictionary definition of the word ‘time’ (donated by John Chesworth). ROBERT NORTH (Ballet Rambert 1981 – 1985). Dancer and Artistic Director 1981 – 1985. A sealed envelope containing a letter from Robert, “with a few thoughts on dance” (donated by Robert North). RICHARD ALSTON (Ballet Rambert/Rambert Dance Company 1980 – 1992). Resident Choreographer 1980 – 1986; Artistic Director 1986 – 1992. A letter from Richard about Madame Rambert’s approval of his new work to Stravinsky’s Le Sacre du Printemps (Richard was Resident Choreographer with the Company at the time); a copy of a letter from Marie Rambert to Richard thanking him for dedicating the work to her; a photograph of Sally Owen as The Chosen One in Richard’s The Rite of Spring (1981); a programme sheet from The Rite of Spring (Landscape, also by Richard, is on the reverse side) (donated by Richard Alston). CHRISTOPHER BRUCE (Ballet Rambert/Rambert Dance Company 1963 – 1987, 1994 – 2002). Dancer 1963 – 1980, 1983, 1986; Associate Director 1975 –1979; Associate Choreographer 1980 – 1987; Artistic Director 1994 – 2002. Christopher’s all-time favourite shoes, first worn as an eighteen year old Tavern Dancer and Gypsy Boy in Don Quixote during 1963/64 and most famously in Cruel Garden in 1977. Christopher wore these shoes until they could no longer be re-stitched and to his great sadness, they finally fell apart (donated by Christopher Bruce). MARK BALDWIN Mark Baldwin (Rambert Dance Company 1979 – 1980, 1983 – 1992, 2002 onwards). Dancer 1979 – 1980, 1983 – 1992; Artistic Director from 2002. The Moleskine notebook is one of several Mark kept during 2010 – 2012. A visual artist as well as a choreographer, Mark’s notebook contains drawings as well as thoughts, notes, teaching plans, Portuguese lessons and ideas for stagings (donated by Mark Baldwin). Photographic journal showing two typical working days in the life of the Company: staff and dancers at work in our premises on Chiswick High Road on March 2nd 2012; rehearsing the Rambert version of Nijinsky’s L’Apres-midi d’un faune and Mark Baldwin’s response to it, What Wild Ecstasy at His Majesty’s Theatre, Aberdeen 15th February 2012. Selection of items chosen by Rambert dancers: toe tape; foot roller (donated by dancer Pieter Symonds); shaker for protein-based food supplement and Jelly Snakes. Rambert has been provided with a once in a lifetime opportunity to build a new home in the heart of London’s cultural quarter on the South Bank. In return for a commitment to provide a significant community dance programme, Rambert has been given a plot of land by Coin Street Community Builders, one of the UK’s leading social enterprises. The new home will safeguard Rambert’s future and that of contemporary dance. As an international centre for choreography, it will cement Rambert’s status as one of the world’s great dance companies, enable it to improve its already excellent artistic standards, be a powerhouse for new choreography and the centre for dance and music in the UK. Every aspect of the building’s design (by award-winning architects Allies & Morrison), operation and programme of education and outreach activities will set new standards for public engagement with the artform. Rambert will move to its new South Bank home in 2013. *Your donation will be deducted from your mobile phone credit or added to your monthly phone bill. Standard text message rate applies. Rambert Dance Company will receive 100% of your donation. Registered charity no. 326926. The Rambert Archive is a fascinating collection of costume, design, dance notation, photographs and moving image, music and sound, documenting the history of the Company from our origins as the first British ballet company, to the present-day. We are currently undertaking a transformational project to catalogue, conserve and deliver a programme of creative learning. This project is made possible by support from the Heritage Lottery Fund. In our new home on London’s South Bank the public will finally be able to access the collections in a purpose-built facility.